Email subscribers are most important part of blogging and online business. So, it is important to increase your subscribers to increase business. Most successful way to increase email subscribers is to install a pop-up opt-in form. No just opt-in, Pop-ups are good to increase social followers and promoting some offers via your website. 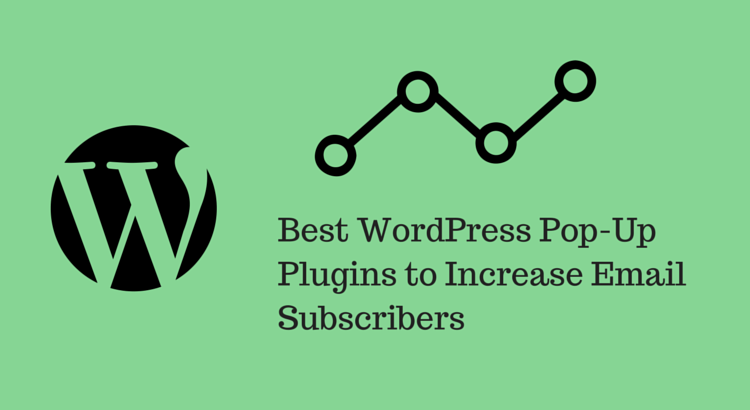 There are various WordPress plugins available which offers opt-in pop-up or social follow pop-up boxes. But, you need to find one which is lightweight and matches your website’s design. There are various free and premium options are available for this. In this post, I am listing best WordPress Pop-up plugins which you can use to increase your email subscribers. ITRO Popup plugin is a free option to add a pop-up subscriber form in your WordPress blog. It uses WordPress post editor to create and customize the content of the pop-up box. So, you can not only add form but also add custom content in the pop-up. This plugin not just offer pop-up but there are also many options to set the visibility of the pop-up box. You can set it to appear on a single post, few selective posts or throughout the website. You can also set it not to show to the same visitor again and again. Another interesting feature of the plugin is its age-verification. If you are offering some kind of adult content, you can add age verification with the help of the this plugin. If you are thinking to have a free option for pop-up box, you can try this plugin. PopupAlly is another free option to create a pop-up email-optin box. You can create email opt-in pop-up box in just 5 minutes without any problem. Its visual editor lets you easily customize the look and feel of the popup box. It is compatible with various email marketing service providers including Aweber, MailChimp, MadMimi, iContact, GetResponse, Infusionsoft, Ontraport, and any others. Basic free version offers very basic options. If you want to try advance option, you will have to upgrade to the pro version of the plugin. Bloom is an advanced plugin to increase email subscribers of your blog. It offers various options including pop-up email opt-in solution. I have also added a review of Bloom Plugin. Bloom Plugin was developed by popular theme maker company Elegant themes. This plugin is not free. You will get it with the developer subscription of Elegant themes which costs only $89 per year. In this subscription, you will get access to all themes and plugins by Elegant themes. If you are willing to pay, I recommend this plugin because of its advanced features and various placement options. It is easy to integrate with most of the email marketing solutions available. With hundreds of pre-defined template, you can easily create beautiful email optin-boxes for various placement of your blog. At the time of writing this post, I am testing SumoMe plugin in my blog. It is not as good as bloom, but it also offers decent features in free package. It comes with one click integration with most of the email marketing service providers. You can set pop-up box and delay loading side box to increase email subscribers. In the pro package, this plugin also offers A/B testing which also helps in knowing the visitor behaviour and hence increase the email list. If you are thinking to use this plugin, I recommend you to check the free package first. Optinmonster is said to be the best plugin to increase your email subscribers with its good looking pop-up boxes. It offers best conversion rates. As a blogger, If you are ready to pay, this is the best option which you must try. You will surely enjoy the conversion rate offered by the plugin. There are various options like delay loading, placement, templates and one-click integration with most of the email marketing solution providers. This plugin is paid with basic package costing $49 per year for single website. YITH Newsletter Popup is also a free plugin which offers basic pop-up option to add a email newsletter box and increase your email list. If you are not in the condition of pay, you can try this free plugin too. It also supports Woo-commerce products. It also comes with page builder option to customize the popup. You can customize background color, typography and can also add custom CSS. Ninja Popups for WordPress is another popular WordPress for adding pop-up email subscription blog. This is also premium plugin available in theme’s marketplace codecanyon. It offers A/B testing to increase your email subscribers. There are various themes which you can use in your blog to create awesome looking email subscription boxes. It also comes with one-click integration with various email marketing subscribers. You can also add Google Analytics event tracking. This plugin only costs $20. At this price, it offers various good features with 24/7 support. It seems an affordable option. Optin Revolution offers this nice pop-up plugin for free of cost. You can easily customize the look and feel of the popup box to match the design of your website. It also comes with support to various email services like Aweber, iContact, GetResponse, MailChimp, Constant Contact and Wysija. There are few popular free and paid WordPress plugins which can be used to create beautiful looking email opt-in boxes. With these plugins, you can easily collect emails and build your email list. What is your favorite plugin for email optin? Share it with us via comments.